Ever wonder why BART doesn’t venture north into beautiful and wealthy Marin County? Back when the Bay Area Rapid Transit agency was being formed in the late 1950s, it was going to include five counties. After San Mateo County opted out, Marin County also dropped out because because of the expense of the plan and plans to alter the Golden Gate Bridge to accomodate trains. 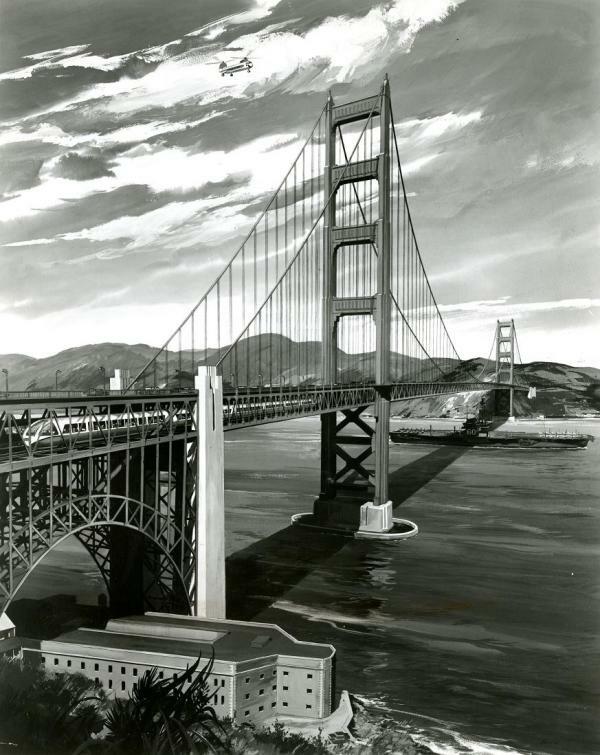 Nonetheless, this blog has some of the early BART renderings of what the train would have looked like in Marin County. One of the more striking images is the one to the right — with trains running on a lower level of the Golden Gate. Hmm. Here’s a link to BART’s website, which has a good history of the agency. More than 100 LED lights along the new section of the Los Angeles River bike path in the Elysian Valley have gone dark after thieves ripped out the copper wiring that the lights depend upon. The city says it won’t rewire and turn on the lights until it figures out a way to prevent such thefts, which have plagued the city in recent years. Hmm. Good thing it’s bright and sunny 24 hours a day in L.A.! Several of the GOP candidates either running for president in 2012 or thinking about it have supported cap-and-trade systems for CO2 emissions in the past. A good thing, you say? Maybe not. Some GOP insiders say candidates who believe climate change is a problem and something should be done about it, could lose support from within their own party. Hmm.